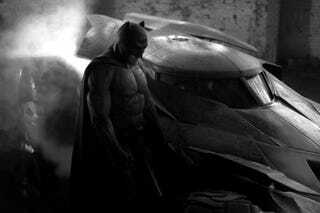 Zack Snyder has finally tweeted a look at his new Batman (played by Ben Affleck) for the still untitled Batman Vs. Superman movie. Aaaaaand the new batsuit has veins. [Edit not veins possibly seams, massive high res. image updated]. Take a look. UPDATE: Here's an even bigger image!